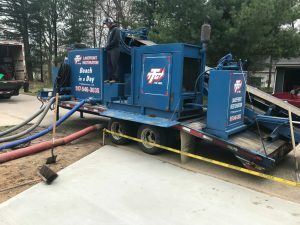 Transforming you Michigan lake waterfront to a beach in a day with Sand Pro! TT&C LLC, originally TT&G, Inc. was established in 1978 as an excavating and gravel company. In 1985, due to increasing demands, TT&G, Inc. became involved with inland lake restoration and improvements. We began dredging shorelines and constructing sand beaches by placing sand either on the ice or lakeward using a hydraulic excavator. TT&G realized changes had to be made to gain access to the lakeside without heavy equipment crossing the homeowners’ beautifully landscaped property. This required an innovative change in our operations, equipment and methods. 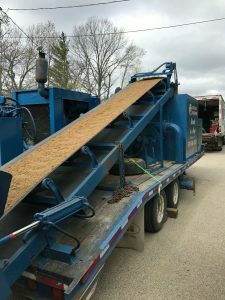 Upon extensive research and testing, our solution was met with the invention of the Sand-Pro, a portable sand slurry plant which was patented in 1989. Joseph C. Trierweiler, President of TT&G, Inc. was granted both an apparatus and method patent for beach restoration. Unfortunately, in 2004, Joe Trierweiler passed. His three sons Curt, Craig and Chris who have been involved in the installation and process of the beaches are carrying on with the dream Joe worked so hard on for so long. They have been raised to understand this process and are passionate about their work and the opportunity that their dad has given to each of them. Today I wanted to share something that has made a huge difference in our lakeshore. 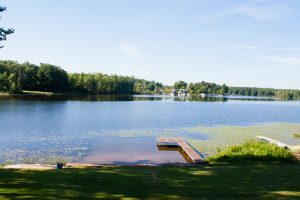 If you are local in Michigan and live on a lake that has a mucky or weedy bottom, this post is for you! Remember when I first showed you all the pic of our “new house” and everyone thought we were crazy? When we bought the place, the name Lily Pad Cottage had never been so appropriate as seen in that before pic! I think lily pads are actually so pretty, but maybe not in the water-top carpet format we had. Not to mention the gross, mucky bottom underneath that made enjoying the water pretty much impossible. No one had used the shoreline for many years on this property (you can see in the before pics that there was actually a chain link fence right up to the water) so the lily pads and weeds had pretty much taken over. We called TT&C Beaches to solve our problem – they specialize in installing these amazing artificial sandy bottoms, and it’s the coolest process to watch! They kindly offered me a discount in exchange for me sharing my experience with you all, but all thoughts and opinions are my own. The company is run by the 3 Trierweiler brothers and the entire process was invented and patented by their father. I’ll explain a bit more, first you need to get a permit from the DEQ. 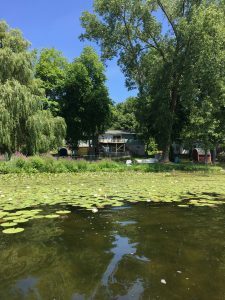 The law in Michigan allows you to do half of your shoreline to essentially create a swimming area without causing damage to the natural lake habitat. You can see the perfect rectangle of nice sandy bottom we now have. It’s amazing how quick the process is, their tagline is “Beach in a Day” and it’s so true.You can see the perfect rectangle of nice sandy bottom we now have. It’s amazing how quick the process is, their tagline is “Beach in a Day” and it’s so true. They come with a special truck and hoses that pull water from the lake and mix it with sand. My son was enthralled with the truck and watching the sand go up the belt. The beauty of the way they do this is it doesn’t hurt your landscaping at all (although we didn’t actually have landscaping at this point), because there is no heavy equipment to get down to the lake, just some lightweight hoses. We had the beach put in this spring before we moved in and it was the best decision. 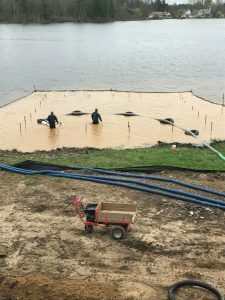 You can see in these photos that the truck mixes the sand and water pumped from the lake and shoots the mixture back out through a hose into the lake. They first stake down a thick mat right over top of any muck or weeds and then cover it with several inches of the sand mixture. They use a heavier sand so it stays put even with boats, etc. going in and out. My dad actually had them do his beach 1o years ago and it’s still in perfect shape. This is several months later and it’s perfectly sandy and feels great on your feet. It has made it so much easier for us to get in and out on the boat. What can I expect the depth of water to be after completion? The MDEQ recognizes the depth of water being from the top of the muck to the level of the water. 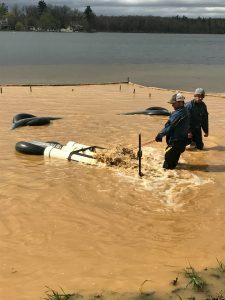 After a 6” depth of sand is installed over the fabric, the weight will immediately begin to compress the muck and further stabilize the beach. This compression process continues for approximately one year. The more significant the depth of the muck, the more it will compress. Normal installations reduce water depth by 4” – 6”. Is dredging a better solution? Dredging is the removal of organic material and weeds from the lake bottom to provide depth. Although extremely costly, permitted dredging is the standard solution for a very large area of a lake. Though sand exists under the muck, the sand always becomes contaminated through the dredging process. Dredging spoils either have to be deposited on the site or trucked off-site. Both are very costly. Increasing the depth in a small area increases the probability that the area will immediately begin to fill in from the shallower adjacent areas that were not dredged. Mother Nature, wind and boat traffic will naturally move silt and debris into this unnatural hole in the lake bottom, which in a few years will be as bad if not worse that previously. It is a temporary solution more than a permanent one. Will the sand stay in place? Sand erosion occurs primarily at the shoreline or in shallow water. Wave impact will not affect the sand beyond a 2’ depth. Only negligent use of a watercraft will erode sand in the deeper areas. Depending on your location on the lake, especially in regard to boat traffic, sand loss may never occur. Install plastic retention tubing on the edge of the beach in the shallow area. Use a sand/pea stone mixture that is more resistant to erosion than sand alone. 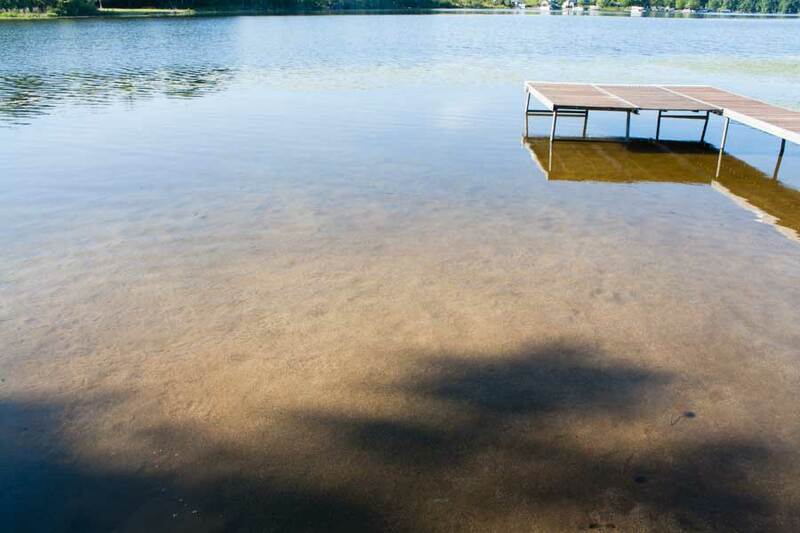 After the beach is installed, how do I maintain it? Silt and weeds easily become suspended in the water floating to wherever the current sends them. Therefore, any activity on your beach will once again suspend the silt and most weeds in the water. The idea is to disturb the silt on windy days or when wave action is present to carry the silt away. This is why the beach is purposely constructed higher than the surrounding lake bottom so that this cleansing process will happen naturally. Sand, which is a heavy-media, does not move readily. Silt on the other hand, will naturally move from a higher to a lower spot with marginal current. Transplantation weeds will only encroach on your beach from the lack of use. Use your beach – constant activity will keep the silt agitated and constantly moving. Annually, or as needed, rake your beach with a large landscape rake that has at least a 5 lb. weight attached to the bottom of the handle. This allows you to drag it without having to apply pressure. Create water movement (ask us for suggestions). Re-plumb your irrigation pump at the lake to be used as a jetting tool. Have TTC, LLC clean your beach annually.